The Think:Kids program trains parents, teachers, psychologists, correctional officers and other professionals to help children with emotional, social, and behavioral challenges build problem solving skills to succeed. Single parenting was a challenge made more difficult when Beth Brooks couldn’t solve the extreme behavioral issues of two of her children. She believed her kids couldn’t grasp the consequences of their bad choices, and she could only watch as they struggled to meet her expectations. With her oldest child, Caroline, eventually landing in the care of the Massachusetts Department of Children and Families, Beth was ready to try a new approach. 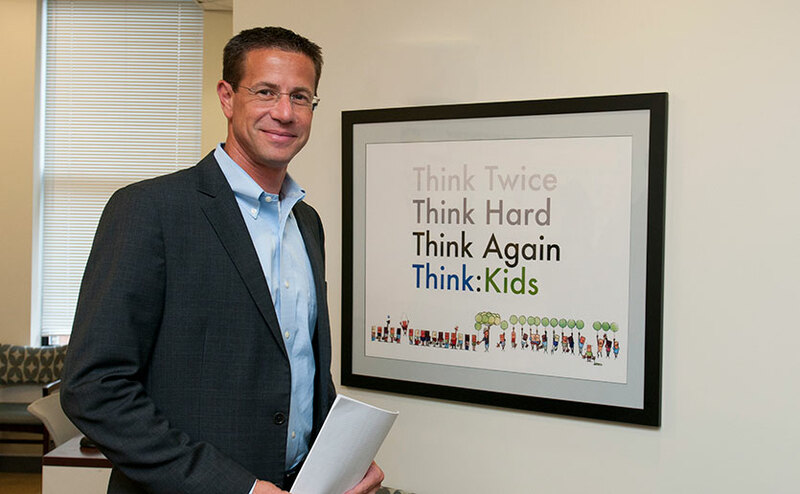 It was the Collaborative Problem Solving (CPS) method espoused by Think:Kids, a program run by the Massachusetts General Hospital Department of Psychiatry. The program trains parents, teachers, psychologists, correctional officers and other professionals to help emotionally and behaviorally troubled children solve problems. Think:Kids trained the staff at the nonprofit organization, Youth Villages, which in turn, worked with Caroline, Beth, and her son, Jack, two years ago. Caroline, now 18, returned to her mother’s care and is attending Keene State College in New Hampshire this fall. She uses CPS as a springboard to diffuse the stress of complicated situations and make reasonable decisions. Jack, 13, also has responded well to CPS philosophy. But Jack and Caroline would have had trouble adapting if Beth hadn’t changed her way of parenting. She now strives to collaborate and show empathy. Think:Kids started at Mass General in 2008. J. Stuart Ablon, PhD, its director, oversees 24 staff members. In addition to training and supporting individual caregivers to use CPS methods with kids, Think:Kids also partners with schools, hospitals and other agencies to train their entire staffs in the CPS approach. Think:Kids aims to ensure that wherever children with social, emotional or behavioral challenges are, that they will be engaged through the more accurate, empathic and humane lens of CPS. Think:Kids is responsible for CPS use in public systems throughout Oregon, Guam and Canada. New York City police officers who work in New York City public schools are now also being trained by Think:Kids. Neuroscientific studies on brain development shattered conventional thinking that a child with emotional and behavioral issues was behaving poorly to get things or avoid responsibilities, Dr. Ablon says. Instead, research shows that many children, especially those who suffer from chronic stress or trauma, have lagging thinking skills. When children yell, cry and exhibit other challenging behavior, they’re actually saying they can’t handle the expectations before them. When dealing with behavioral issues, some adults try to impose their will on children, the method Beth Brooks tried for years. Others drop their expectations, a tactic that doesn’t necessarily help children. At its foundational level, the CPS approach advanced by Think:Kids is different. It calls for adults to work with children on an issue first by identifying the child’s concern, then by having the adult share his or her thoughts about the issue. Adult and child then brainstorm solutions, working to where they together choose one that is realistic and mutually satisfactory. Reaching a collaborative solution won’t always be easy, Dr. Ablon says, but the effort ultimately develops children’s problem solving skills and diminishes their impulsive behavior. Parents, meanwhile, recognize their children weren’t acting manipulatively. “Knowing that a child lacks skill, and not will, helps adults not feel disrespected and instead puts them in a position to be empathic,” he says. If you would like to support the work of Think:Kids, please go to the organization’s Rodman Ride for Kids fundraising page.